Mr. Thomas worked as a media relations specialist before turning to painting after moving to Maine in 2003. 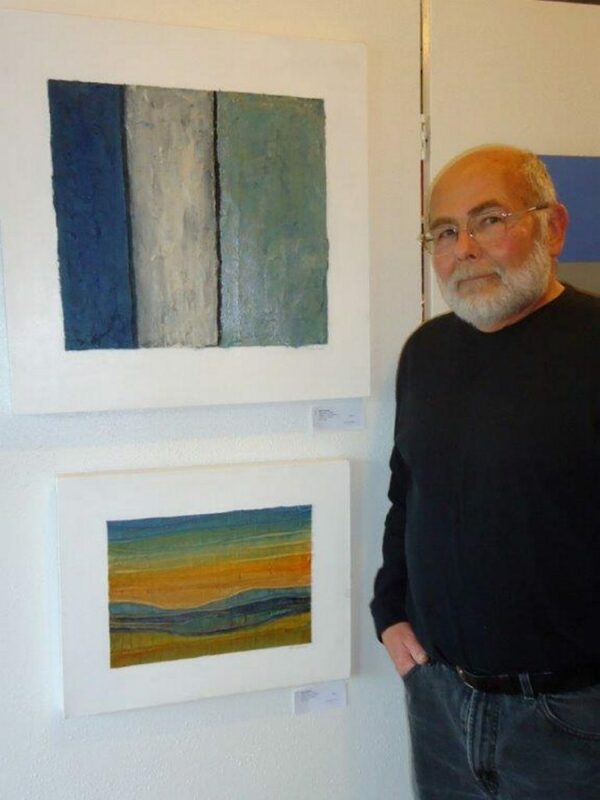 Robert “Bob” Thomas, an accomplished artist from Edgecomb known for his textured paintings of old walls in Beirut, Lebanon and his use of color to capture Maine’s landscapes, died Monday after a long illness. He was 73. His paintings have been shown in galleries across Maine including the artist-owned Stable Gallery in Damariscotta. His work will be featured in a June exhibition and will remain on view this summer. Mr. Thomas became an artist after years of living in Beirut, then working as a writer and media relations specialist for companies ranging from AT&T and Intel to New Jersey Bell and Ashland Oil. His wife, Lea Wait, recalled the day they met. It was April 1, 1968, in New York City. They were speech writers for At&T and became good friends. A few years later, he was the photographer at her wedding. Four years and two divorces later, Wait and Thomas got together. He visited her in Maine for the first time for Christmas in 1976. Mr. Thomas bounced in and out of Wait’s life for many years – she said they had different goals in life. But by 2003, he was ready and moved to Maine to be with Wait. They were married on Oct. 28, 2003, 12,994 days after they met. Mr. Thomas began painting around 2007 and immersed himself in Maine’s art community. He was known for textured paintings, influenced by the old walls of Beirut and the colors of Maine. Daniel Kany, an art historian and freelance writer for the Portland Press Herald, said he met Thomas in 2008 when the artist walked into Kany’s gallery and insisted on showing his paintings. Kany described his work as spare and spiritual. His paintings have appeared in the River Arts in Damariscotta, the Saccarappa Art Collective in Westbrook, Studio 53 Fine Art in Boothbay Harbor, Southport Memorial Library and other galleries. He was a member of the Stable Gallery. Mr. Thomas was inspired by his surroundings in Edgecomb. Wait said he loved sitting on the porch looking out over the Sheepscot River. He could see the sunset from their bedroom window. His wife said he loved socializing with neighbors, talking about art and politics, and drinking scotch. He was a good cook as well. About two and a half years ago, Mr. Thomas was diagnosed with congestive heart failure, followed by COPD and a minor stroke. He continued to paint until six months ago. Wait said he fell asleep at 5:30 a.m. Monday at home and didn’t wake up. She was with him when he died. A celebration of Thomas’ life will be held from 4 to 6 p.m. Friday at the River Arts Gallery, 241 Route 1 in Damariscotta.